I have a weakness for cold pasta salads. The really cool thing about cold pasta salads is that there are so many different pastas, veggies and salad dressings that one can literally invent a delicious cold pasta salad on the spur of the moment. Simply throw together your favorites, or boil up noodles, empty out your vegetable bin, add a dressing and voilà! Cold pasta salad. Your way. There is no end to the variations of combinations one can try. The only limitation is finding what’s in season. Do you like cheese? Tacos? Peanut butter? (We’ve already been down this road.) Asian-influenced flavors? Anchovies? Asparagus? Doesn’t matter. If you like any of these, or if you have your own favorite flavors, simply whack them together, add your favorite dressing and go for it. For fun, I Googled “cold pasta salad,” and the search came back with more than 1.3 million hits. In 1.5 seconds. I browsed through about 10 pages of the returns, and I have to admit that I couldn’t find a single one I didn’t want to taste. Try it yourself. But before you do, set yourself some parameters for what you’re looking for and what you’re willing to add or leave out. I believe that the best way to judge a really good pasta salad is to determine how many of the major food groups you can stuff into a single bowl. Greens, proteins, fats and carbs, all in one bowl, is certainly the Holy Grail. Imagine a nice spinach and bacon salad with parmesan cheese and sweet vinaigrette. Or perhaps a grilled-chicken Caesar salad with croutons and a homemade dressing. Yum. Great for guests, great for families, great any time of the year. On the other hand, they’ve been done so many times that, while certainly classic, something different and a little bit tangy with assertive flavors might be really interesting. Try this salad, using spinach greens, feta and cheese or spinach tortellini. It goes well with grilled steak, chicken or sausages, or it can stand alone as a cold dinner salad. I often take this salad when we are invited to an outing where someone says “bring a dish.” And maybe the best part is how easy it is to make. I am actually making the salad for supper tonight as I write this. Local spinach is at peak season right now and is available at all your favorite markets. I buy mine at John Stoner’s vegetable stand at Central Market, but it’s available across the county. Right now the spinach is about the best it’s going to be all year. If you can find freshly made tortellini and feta cheese, even better. But any way you make it, this one will be a hit. Place tortellini in 4 quarts of boiling salted water and stir gently until the tortellini all float. Drain quickly and immediately plunge into ice water. Allow to cool completely. Remove the stems from the spinach leaves and clean the spinach well in a large bowl of cold water, to remove any sand. You might need to rinse more than once. Then allow to drain and dry completely. 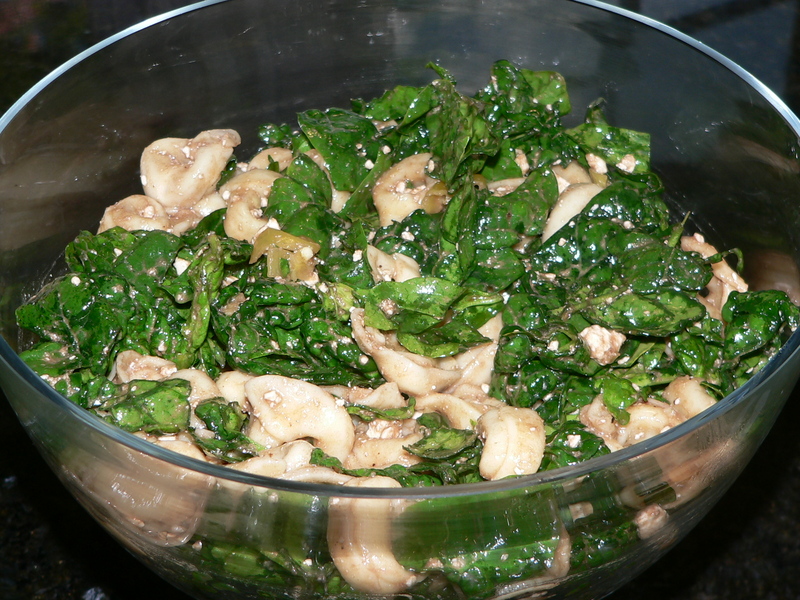 About two hours before serving, place the spinach, tortellini and feta cheese into a large bowl and toss. Add the oil, vinegar, salt and pepper, and toss to coat the ingredients completely. Mince the peperoncinis, separate the seeds and place the minced peppers in the salad and toss to mix well.